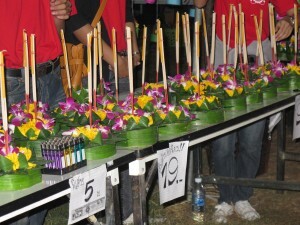 Last week, Bob and I got to experience one of the many Thai festivals that take place throughout the year. Loy Grathong, which translated literally means “to float the boat” or “banana raft”. 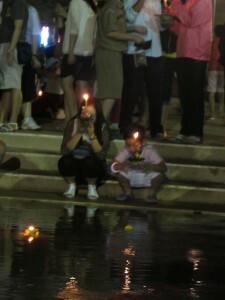 It is a festival that Thais celebrate on the first full moon in November. 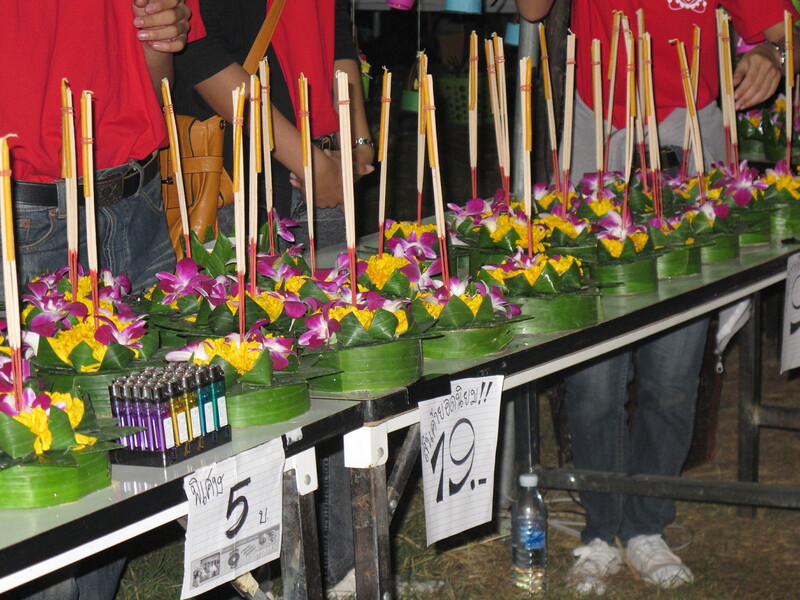 The festival is similar to a small fair in America. There are fair rides, lots of food stalls, fair games (although still not fair), and people selling clothes, shoes, etc. However, the main difference between an American fair and Loy Grathong is the Buddhist aspect of floating a hand-made boat on a body of water as an offering to the river-god. Traditionally, the small “boats” are made from banana leaves or parts of the tree, and Thais put candles, food, coins, and flowers on these small rafts. They float these boats on rivers, ponds, or any other body of water, and they pray that the river-god would take away their bad luck or sin and give them good luck. To the Thai, Loy Krathong signifies a new beginning and gives everyone a chance to change his or her life for the better. It’s hard seeing hundreds and thousands of people praying to a mystical, impersonal river-god when they could turn to Christ, the one, true and holy God, who will take away all their sin and grant them eternal life. Oh, how the Thai people need to know the truth of the Gospel and that Christ is the only one who can give us a new heart and change us!